CYKO KO #1 Is the Joy & Hilarity You’ve Been Looking For! 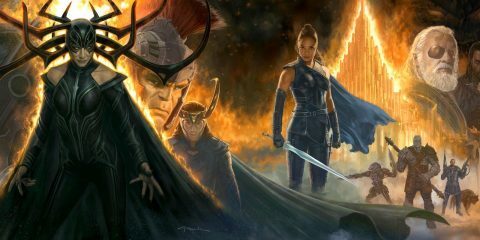 There’s an idea that’s sometimes all-too-prevalent in the comic book world that a comic has to have a heaviness, a weighty darkness or seriousness to pull in adults readers. Following that same line of thinking, for a series to cater to all ages is nearly impossible, then, as crossover appeal is too difficult to make a reality. 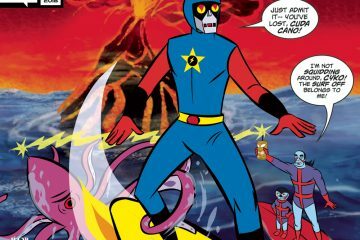 Creator Robert Feldman doesn’t abide by any sort of eyeroll-worthy “conventional wisdom,” however, as seen in the first issue of his comic Cyko KO, on sale Wednesday from Alterna Comics. 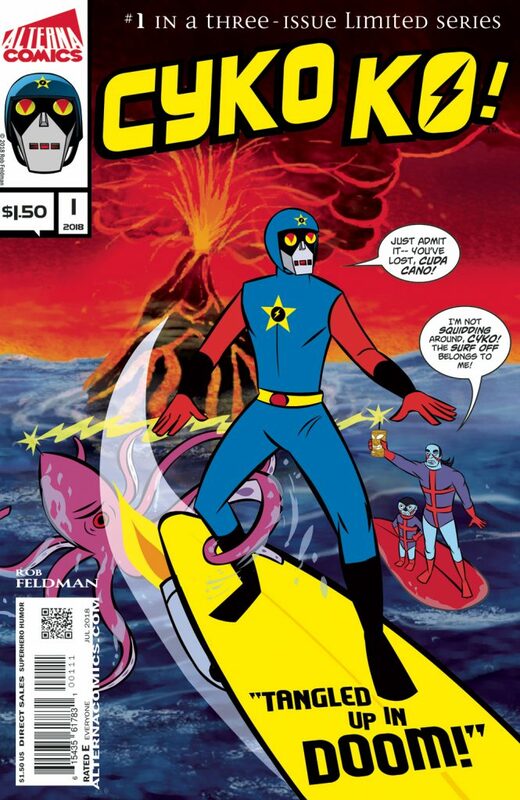 For the uninitiated, Feldman’s character Cyko KO was been around for a while now, appearing in everything from a season on his own massively popular webcomic site LINE Webtoon to a coloring book published via Kickstarter with Alterna. However, that shouldn’t dissuade new readers from picking up issue #1, as all you really need to enjoy Cyko KO are the basics: Cyko KO is stunt motorcyclist who has been tasked with protecting SuperEarth and her colonies from villains and ne’er-do-wells who’d threaten its safety. Aiding him along the way is his lady friend Peachy Keen and Meemop, their adorable pet. Reading creator Robert Feldman’s Cyko KO is akin to being transported to a whole host of cartoon and comic book universes that have congealed with each other into a tapestry of psychedelic, fourth-wall breaking hilarity. Cyko KO can be described as equal parts Hanna-Barbera boldness, early Adult Swim silliness, and Looney Tunes temerity, with a dash of hyper surrealness and fourth-wall-breaking goodness. 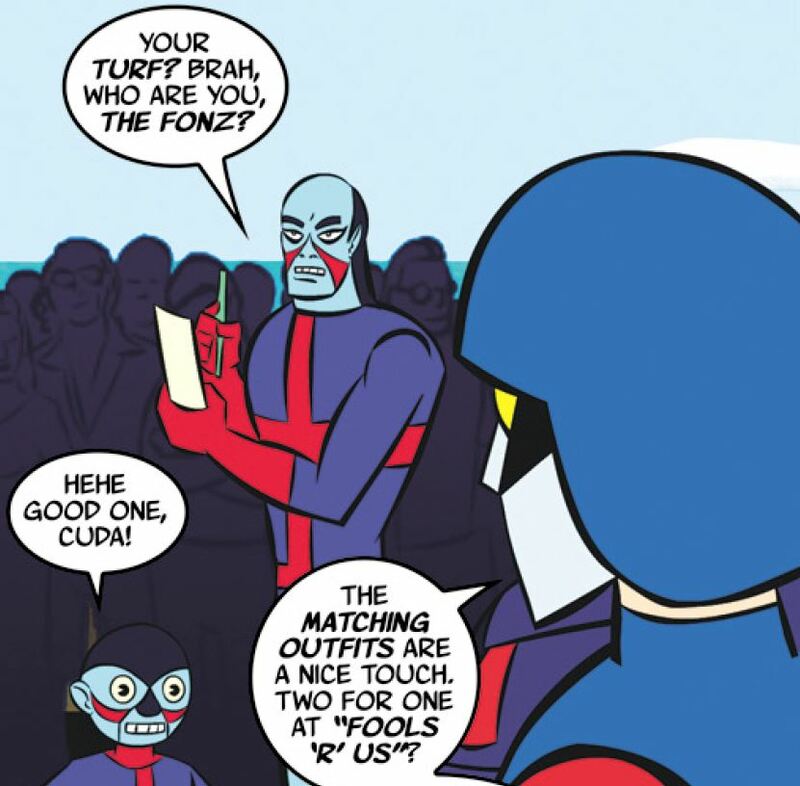 And that sensibility extends to where we find Cyko KO and his crew in the debut issue. Cyko and Peachy decide to take some much needed R&R in Surf City, located in SuperEarth Sector 17, location of Cyko’s big surf victory over Cuda Cano five years ago. However, upon arriving in Surf City, Cyk’s spirits are dashed to find that Cuda is contesting his title, leading to a surf-off challenge. To make matters worse, his buddy Dippy hasn’t been seen a week, coinciding with the appearance of a giant squid off the shores of Surf City. How do the squiddy-do and a mysterious tiki Peachy finds fit in Cuda’s plans? Ri-damn-diculous. How could you not be all-in after hearing that setup? The stakes, you can see, are just as low and as high as that. One of the things that makes Cyko KO #1 so endearing and engaging is that, while whether Cyko loses his title may not be the end of the world, Feldman has given us enough characterization of Cuda and the rest of the book’s cast in just a few lines that we’re immediately invested, that we certainly don’t want that loser Cuda to win. That sharp, concise characterization is applied to the rest of the cast as well. 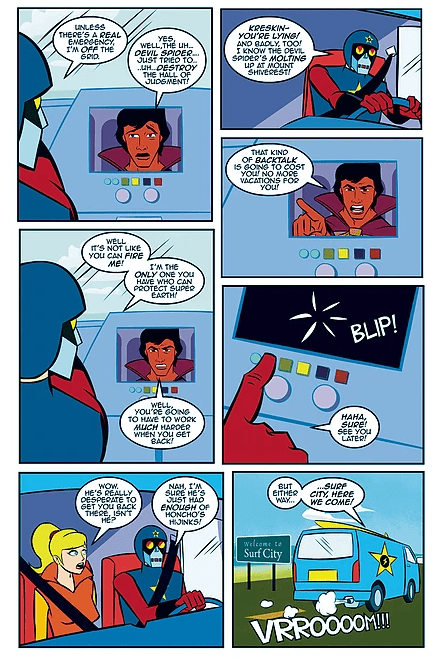 Even if you’ve never read any other Cyko KO tale prior to this issue, you’d know in a smattering of pages that Cyko is full of sass—whether telling his boss to buzz off or mocking his adversaries’ plans—and has a deep earnestness for life—especially if it involves Dippy Donut Dive’s Donut Sludge. That sass carries into the surreal nature of the book as well. Cyko KO #1 doesn’t hit readers over the head with the fourth-wall-breaking conceit, but it carefully picks and chooses its times to acknowledge that Cyko realizes that sometimes things going about him are just way too ridiculous to be real, with him poking at the plot of the story or making suggestions how to wrap things up more quickly. For a character whose face is covered by an inexpressive mask, we know right away from Feldman’s dialogue that his boy is full of irreverence. 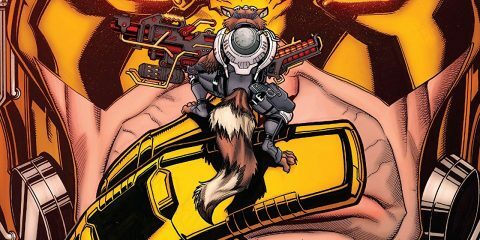 However, that irreverence is carried over into the ebullient, buoyant art the creative team brings to each and every page. As much as it feels like it shares DNA with Adult Swim and Filmation and Hanna-Barbera classics, Cyko KO #1 is also clearly a love letter to those shows. Viewers always walked away having laughed and felt a little lighter for the experience, and we see Feldman bringing in everything from character designs of Dippy and Meemop to Cyko’s exaggerated body language when he and Peachy find a possibly cursed tiki to pay homage to that feeling. 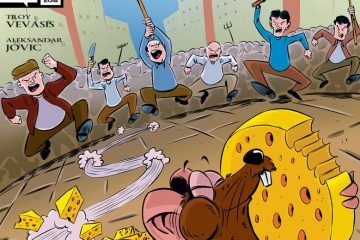 Brendon and Brian Fraim and Toon360 aid in Feldman in giving the comic that updated yesteryear feel with their breakdowns and backgrounds, while letterer Peter Simeti (who doubles as the book’s editor) makes the book sound in my head like those old Hanna-Barbera classics. With all these ingredients in the mix, Feldman is expressing his love for those formative pieces of hilarity, while trying to bring them to the 21st century so modern audiences can experience that same love and wonder. And he nails the landing. Beautifully. Hulu recently did a documentary about ABC’s The Dana Carvey Show, which featured cast members—including Steve Carell—commenting on their time making the series. Carell said something that feels very much in tune with the tone of Cyko KO; he noted that what he loved about The Dana Carvey Show was that it “didn’t have an axe to grind,” that all the cast and crew were trying to do was be funny. This feels very much in line with what Feldman and the team behind Cyko KO are setting out to accomplish: The book seems to have no agenda other than to shove in as many laughs in a single issue comic as possible, and they do that easily. Cyko KO #1 is proof-positive that an “all ages” label can be more than lip service to pull in more readers or viewers. In the hands of the right creator–one, like Feldman, who has an honest, genuine, passionate love for the comic book medium–a comic can appeal to a wide array of readers’ sensibilities and senses of humor. That unabashed love for what they do is something Feldman and his fourth-wall-breaking baby have in common. Cyko KO #1 (of 3) goes on sale this Wednesday, July 25th, from Alterna Comics. SuperEarth’s greatest hero is here! Cyko KO is the fourth-wall breakin’, pinball-addicted, motorcycle-ridin’ hero you’ve been waiting for! When Cuda Cano (Cyko’s oldest rival) challenges Cyko to a “friendly” surf off, he just can’t resist. But with a remote control giant squid at his disposal, Cuda’s playing for keeps! CYKO KO #1 Is the Joy & Hilarity You've Been Looking For! Cyko KO #1 is proof-positive that an "all ages" label can be more than lip service to pull in more readers or viewers. 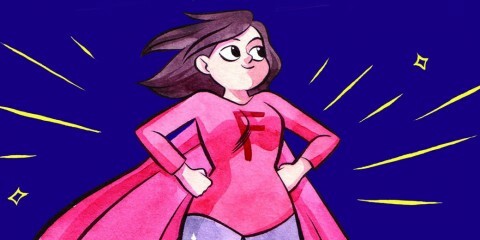 In the hands of the right creator--one, like Feldman, who has an honest, genuine, passionate love for the comic book medium--a comic can appeal to a wide array of readers' sensibilities and senses of humor. That unabashed love for what they do is something Feldman and his fourth-wall-breaking baby have in common. 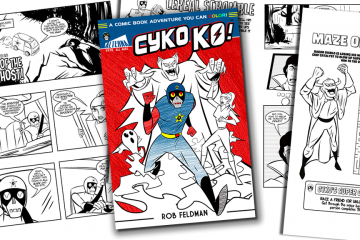 Creator Robert Feldman on a New CYKO KO Series!